coverageBed computes both the depth and breadth of coverage of features in file A across the features in file B. For example, coverageBed can compute the coverage of sequence alignments (file A) across 1 kilobase (arbitrary) windows (file B) tiling a genome of interest. One advantage that coverageBed offers is that it not only counts the number of features that overlap an interval in file B, it also computes the fraction of bases in B interval that were overlapped by one or more features. Thus, coverageBed also computes the breadth of coverage for each interval in B. -s Force strandedness. That is, only features in A are only counted towards coverage in B if they are the same strand. By default, this is disabled and coverage is counted without respect to strand. Report a histogram of coverage for each feature in B as well as a summary histogram for _all_ features in B. -d Report the depth at each position in each B feature. Positions reported are one based. Each position and depth follow the complete B feature. -split Treat “split” BAM or BED12 entries as distinct BED intervals when computing coverage. For BAM files, this uses the CIGAR “N” and “D” operations to infer the blocks for computing coverage. For BED12 files, this uses the BlockCount, BlockStarts, and BlockEnds fields (i.e., columns 10,11,12). Below are the number of features in A (N=...) overlapping B and fraction of bases in B with coverage. Use the “-s” option if one wants to only count coverage if features in A are on the same strand as the feature / window in B. This is especially useful for RNA-seq experiments. One should use the “-hist” option to create, for each interval in B, a histogram of coverage of the features in A across B. In this case, each entire feature in B will be reported, followed by the depth of coverage, the number of bases at that depth, the size of the feature, and the fraction covered. After all of the features in B have been reported, a histogram summarizing the coverage among all features in B will be reported. One should use the “-d” option to create, for each interval in B, a detailed list of coverage at each of the positions across each B interval. The output will consist of a line for each one-based position in each B feature, followed by the coverage detected at that position. 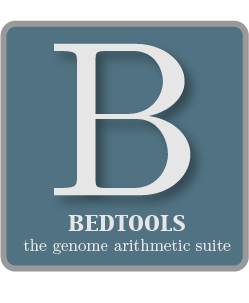 As described in section 1.3.19, coverageBed will, by default, screen for overlaps against the entire span of a spliced/split BAM alignment or blocked BED12 feature. When dealing with RNA-seq reads, for example, one typically wants to only tabulate coverage for the portions of the reads that come from exons (and ignore the interstitial intron sequence). The -split command allows for such coverage to be performed.